For extraordinary heroism in connection with military operations against an opposing armed force. 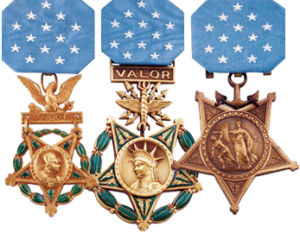 The Air Force Cross was established in 1960 to honor heroism of the highest degree that did not merit the Medal of Honor. Previously airmen of the Army Air Corps were awarded the Distinguished Service Cross for such actions. 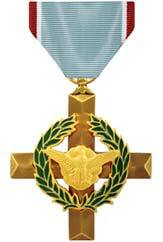 The Air Force Cross became the unique award of the United States Air Force to replace the Army Award for members of their own branch of service. The Navy Cross (Navy, Marines & Coast Guard) and the Distinguished Service Cross (Army) all join the Air Force Cross as our Nation's second highest military award.